AK Interactive is widely available in many parts of the world. My part isn’t one of them so I’ve been curious when, once in a while, an AK item makes its way to the shelves at a shop near me. Usually this takes the form of paint sets, washes, or other ‘technical’ unguents and potions designed to take your modelling to the next level. If that level be up or down depends on how adept you are at figuring out just what to do with said potions. The DAK Profile Guide, however, had me from the moment I opened the cover. Only durable surfaces need apply. For a modeller interested as much in creating hard-wearing, durable surfaces as fine detailing and near photo realistic finishes, the AK potions are really cool but often impractical, especially at the price they go for in Canada. Topcoats like Future, Testor’s Dull Cote, and Vallejo Matte Varnish will often obscure the subtle effects that AK products produce so, except when I put them to use doing the very rare ‘display case only’ model, I often take a pass on them. This book; however, I left on the store shelf the first day only to phone the store and go back the next day. It’s a historically accurate, beautiful, practical guide – as applicable to models used strictly on the gaming table as to models given pride of place at eye level in the display case. 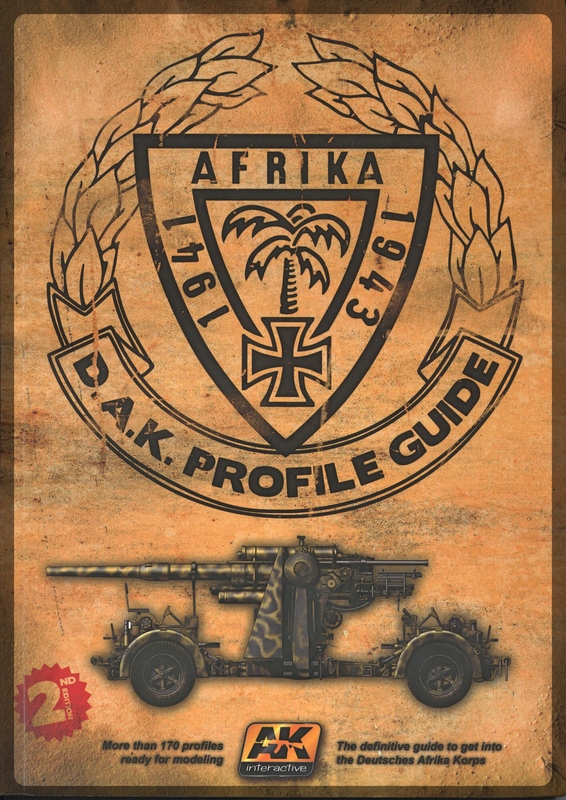 Historically Accurate: There is a quick de rigueur summary of the Africa Campaign in the first few pages designed to set the context for the vehicles to follow with no pretense to offering a fresh historical perspective. This leaves ample room for impressive vehicle prints, some with accompanying original photos, that make it quite clear where and when each vehicle participated in the African Campaign. This combined with a ~200 word summary for each item stating development, purpose, production, and deployment rounds out the package. While my research was by no means exhaustive a solid spot check of vehicles, markings, and locations all rang true. As well as individual vehicle, unit, and other markings every paint scheme in the book has German RAL reference system colour codes. Even the captured vehicles which still wear some of their Allied paint schemes come with paint codes. More authentic attention to detail here that will allow me to get on with the enjoyment while saving work. Yes please! Beautiful: Printed on heavyweight satin-finished paper the colours are alive on the page. Practical: Well portioned sections dedicated to Light, Medium, Heavy, Armoured Fighting Vehicles, and Artillery are rounded out with sections on Markings, Colours, Photos, and Reading List. 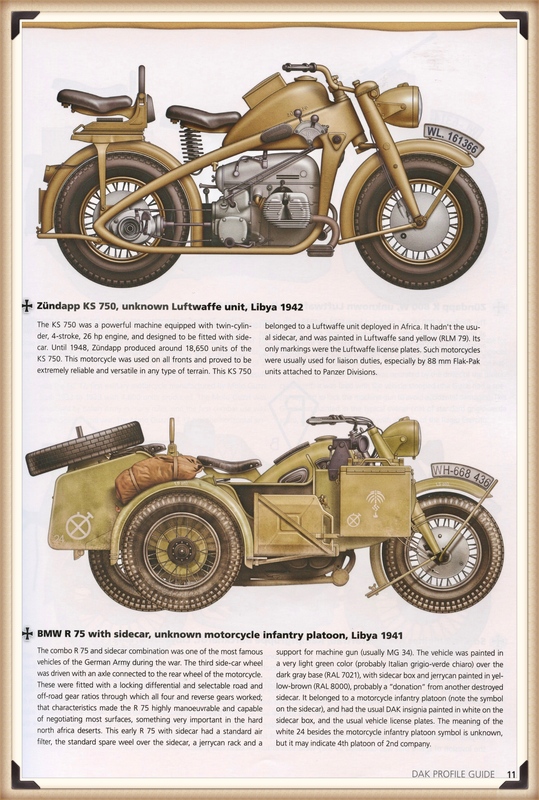 The book gives enough examples to fully inform the correct colouring and detail of a particular vehicle or sub-type to allow even a Bolt Action completionist to reference his entire army. 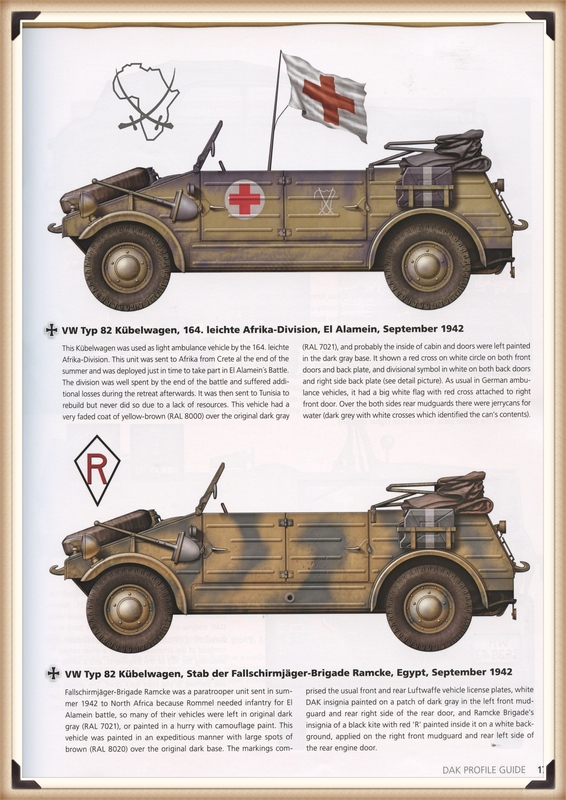 As mentioned, paint codes are given for every vehicle so whether you’re doing yet another Opel Blitz or Kubelwagen for your army or an obscure ‘one off’ captured vehicle the book has you covered. Of course I’ll be going to other sources for specs and other important facts like dates and amount of production but I feel I’m well covered when it comes to paint schemes and markings. But: The book fell strangely short in the number of views it gave of vehicles. You get a great side view of every item, often with obscured markings illustrated off to the side, but only about eight more front views and none at all for rear or top views in the entire book except for the sole exception of Romell’s personal plane. I can’t but help thinking this was a missed opportunity as they obviously had a very talented illustrator and design team on hand already to do the drawings. I would have appreciated a smaller front or rear view image at more regular intervals. But: The price drove the above point home all the harder. It might be considered reasonably priced in the EU, I’m not sure, but it comes at a premium here in Canada. I wasn’t shortchanged but it’s a few alternate views short of perfection for me. Would I buy it again? A resounding yes! At six weeks on I’m still paging through it to see the vehicles again and dig out specifics on the 15. Panzer Division I’ve decided on for my DAK. It certainly rewards multiple readings and is proving instrumental as I build up my paint collection to paint my DAK vehicles. I’ve no doubt that it’ll be front and center once I start airbrushing as well. How about you? Do you own it or have you seen it? If so, would you buy it again? ← Game On a New Continent!